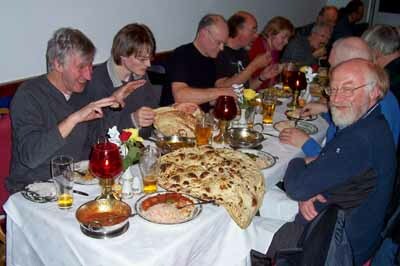 The annual Lothians Radio Society Christmas Curry was held on Wednesday, 12th December 2012 at the Himalaya Tandoori Restaurant at Bruntsfield after cocktails at Montpelier's Bar. Click for Photo Report. 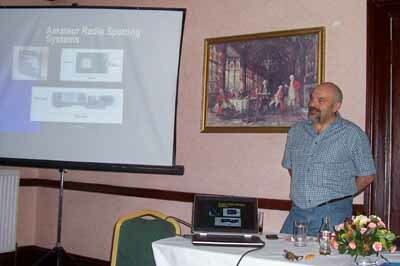 At the LRS meeting on 14th November 201 our new president, Andy Sinclair MM0FMF presented his President's Address - "Amateur Radio Spotting Systems" including applications for SOTA - Summits On The Air. Click for full report. 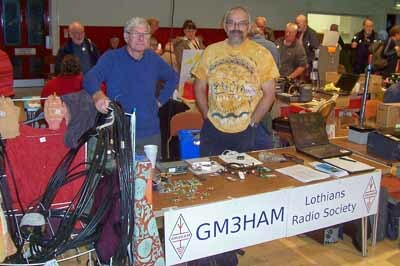 The Lothians Radio Society had a promotional table at the Galashiels Rally on 21st October 2012. John GM8OTI operating GB0BSS at Bonaly Camp while Cubs from the 4th Braid Group look on. The Lothians Radio Society operated GB0BSS in JOTA-2012 at Bonaly Scout Camp near Colinton on Saturday 20th October. The operators were John GM8OTI and Alan GM3PSP. 25 QSOs were made on 40m, 20m and 2m including 9 overseas countries. 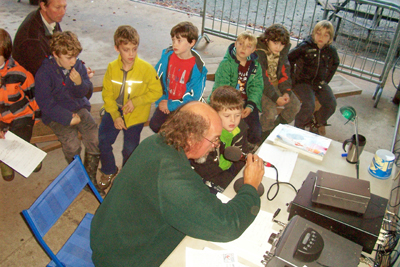 The Scouts and Cubs were given the opportunity to speak into the microphone. Full report with photos in Society Activities. This impressive item was described at the meeting. Photo courtesy of the APSS website. 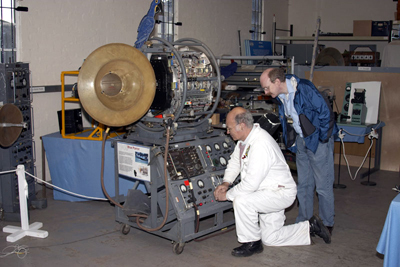 At the LRS meeting on 31st October 2012 Bob Thomson described the collection of Radio, Radar and Avionic items looked after by the Aviation Preservation Society of Scotland (APSS). The collection consists of items belonging to the National Museums of Scotland (NMS) as well as items owned by APSS. They are based at the National Museum of Flight at East Fortune in East Lothian and are open to the public every Wednesday during museum opening dates. Click for full report. See also the APSS website. 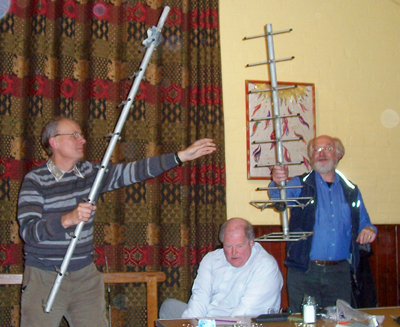 A nice 18-ele 70cm yagi was one of the items sold. There was a record attendance of 37, including many visitors from other clubs, for the LRS autumn Surplus Equipment Sale on Wednesday 17th October at St Fillans Church Hall. A lot of equipment changed hands and the evening was enjoyed by all present. Click for full report with photos. 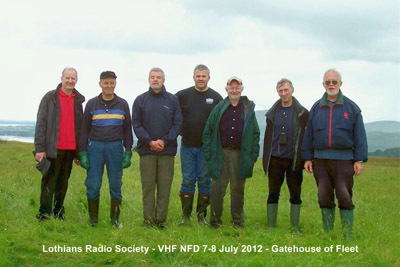 The Lothians Radio Society operated GM3HAM/P in the Restricted Section of VHF NFD on 7-8 July 2012 from a site near Gatehouse of Fleet in Dumfries and Galloway. The contest results have just been announced by the RSGB - CLICK for full access. The LRS did very well, coming in at 2nd place nationally and 1st in Scotland, retaining the Cockenzie Quaich. We gained 1st place on 70MHz and 2nd place on both 50MHz and 144MHz. In the following table scores are "normalized" relative to the leader at 1000 pts per band. See the FULL REPORT with photographs. 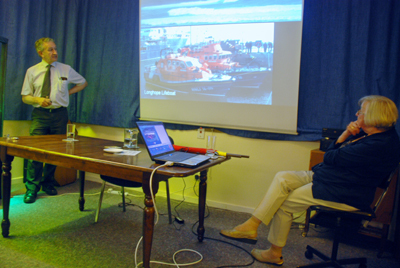 Members of the LRS made their annual visit to the Museum of Communication in Burntisland, Fife, on Wednesday 26th September 2012 for a presentation by Prof. Tom Stevenson and Dorothy Brankin of the MOC on "Marine Communication", the theme of this year's exhibition at the museum, which was open to visit after the talk. Click for Full Report with photographs and several useful links.